PATRIOT: Those who argue that fighting is the only solution to the ethnic problem never come forward to sacrifice their loved ones family to safeguard the country. It is those who believe that fighting is not the solution towards achieving peace ultimately sacrificing their loved ones to fight the war because they are true patriots. Another exemplary military leader who permitted both his sons to safeguard the sovereignty of our country is portrayed this week. 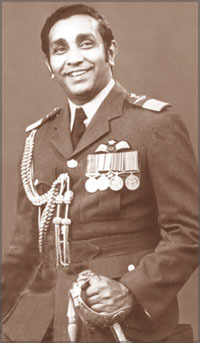 It is non other than Air Vice Marshal Harry Goonatilake, the fifth Commander of the Sri Lanka Air Force from 1976-1981. Once he was a proud but a sad father when the Avro carried 45 armed forces personnel came under missile attack of the LTTE on 29th April 1995. The pilot of this aircraft who made the supreme sacrifice was his younger son - Group Captain Shirantha Goonatilake. It was his last few words on air "A missile is coming on my way" made the Government known, for the first time that LTTE possessed missiles. Another time he was a proud and happy father when his elder son Air Marshal Roshan Goonatilake took over as the 12th Commander of the Sri Lanka Air Force. This made a world record as it was the first time the father and son became Commanders of the same Force. Harry Goonatilake was born in Mutwall on 27 November 1929 as the only boy in a family with five girls. His father was a booking clerk in the Railways Department and became an Assistant Transportation Superintendent at the time of retirement. His mother died when he was only five and this loving father made sure that his only son's education wasn't interrupted due to his transfers and the absence of a mother's affection. Air Vice Marshal Goonatilake's younger son. He was admitted to the Royal College and boarded in a hostel from the first day of his school. He studied up to his HSC and London Matriculation at that time at Royal College. It was the military uniforms that attracted young Goonatilake for the first time. "I applied to join the Navy but failed at the medical test as I had a flat foot. Then DIG Sydney Soysa who was the Rugby Coach at Royal College wanted me to join the Police because he was forming the Police Rugby Team. Again I was underweight and he gave me a tip. "Drink a glass of milk with added plantain pieces for three months. Then I will take you," was the tip. "So I did that and in the meantime the Air Force advertised for Cadet Officers and I applied forgetting the Police. Finally I joined the first batch of the Sri Lanka Air Force in March 1951. Now looking back 55 years I would like to think that the Police and Navy setback was Air Force's gain," he said. The first batch of 10 Air Force Officer Cadets were trained at Katunayake by the Royal Air Force instructors for three years. "Nothing was organised at that time so it became the longest course in the history of the Air Force. "However the Britishers left Sri Lanka after three years of my joining and I went up the ladder very fast but too soon and became the Commander in 1977 after 26 years of service," he said. 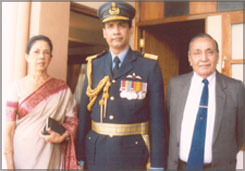 Air Vice Marshal and Mrs Goonatilake with their son Air Vice Marshal Roshan Goonatilake. As a result of a four year love affair, in 1955 he married Marian Perera, a daughter of a planter from Kadawatha and became a father of two sons and two daughters - Shirantha, Roshan, Shamini and Shiromini. Referring to a significant incident that took place in April 1971 he said: "When the JVP attacked several camps I was informed by then Prime Minister Sirimavo Bandaranaike to do everything that was necessary to smash the insurrection. She raised her hands above her head adamantly and furiously and said: "Do what ever you have to do to bring this situation under control, I will not interfere." Keeping to her word she never interfered. "Under my instructions the pilots carried out several helicopter attacks whilst the Army and Navy took positions. The JVP had only shot guns those days. Within five weeks everything was brought under control and we were back in our offices by Vesak in May that year. While appreciating the strong political backing of the Prime Minister he regretted "Today we are dragging this ruthless war for the 23rd year." During his distinguished 30-year career in the Air Force he held almost every position, which include OC Flying, OC Administration, Director Operations and Chief of Staff. He captained the Air Force Rugby Team, which became the Inter Services Champions. He followed a number of overseas courses in several countries such as India, Malaysia and USA. He went to Hatfield in UK by a Dove aircraft to bring the new Heron Aircraft with a team of three others. Many years later he organised a big carnival covering two grounds, which were connected with overhead bridges at Parsons Road Sarasen grounds. "I discussed with then Army Commander Lt. General Denis Perera and Army did an excellent job. The Chief Guest at the opening ceremony Prime Minister Premadasa was highly surprised to see the huge overhead bridge from one ground to the other. "To this day, I believe that this idea of mine was picked up by him, and overhead bridges that you see today in Maradana, Fort and other areas was made after seeing the bridge that the Air Force put up with the help of the Army. The Air Force Seva Vanitha Branch was also formed during his time as the Commander. Even the Ex-Air Force Association, which is over 25 years old now, was formed by him. Asked what made him to send both his sons to join the Air Force he said: "It was their choice, I never encouraged or discouraged them. My father did not stop me when I wanted to join the Air Force. Likewise I too followed his footstep. Both my sons were brought up in an Air Force environment and they were inspired by the camp atmosphere from their childhood. However both of them had their own capabilities. But I explained to them the risk I went through with my experience where I had several narrow escapes. In one occasion I lost one engine soon after take off and had to force land, flying dangerously at the level of coconut trees on the airfield. But my sons did not take them seriously. Both of them have completed 10,000 flying hours when I have done only half of that, only because I had to commence my administrative career sooner than others because being the first batch of the Air Force, we were required to replace the British" he said. 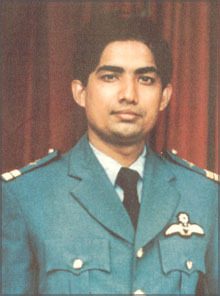 Air Vice Marshal Goonatilake retired from the Air Force at the age of 51. He was awarded a number of medals - Services Inauguration, Uttama Seva, Long service, etc to name a few. He is the only service commander probably in the history who did not have a house or a car on his retirement. "I remember, just before my retirement I went to meet Prime Minister and Minister of Housing R.Premadasa and told him that I don't have a house to go. Then he gave me this flat, which I am living now. I paid a monthly rental of Rs. 225 for a few years and later got the ownership by repaying Rs. 90,000 which I had to pay back to get the title deeds. After retirement he was appointed a Director at Air Lanka for a short time. "But I quitted the post due to disagreement with the then Chairman, an Army Officer, who seemed to think that he knew more about flying and aircraft than I did" he said. Although he retired from the Air Force he never gave up serving society and the country. In 2003 he voluntarily undertook to form Ranaviru Family Counselling Service through the Association of Flag Rank Officers (ARFRO) which is the pilot project and did a great service to war widows and their children to come out from the trauma and tragedy and pick up their lives from where the heroes left them off. He was deeply saddened about his young daughter-in-law, the wife of late son Shirantha and his two children. This motivated him to do this service for all wives of fallen war heroes in the country. He organised counselling sessions, conducted various self employment training programs and organised get-togethers for widows and their children in distance areas like Matara, Anuradhapura ,Kurunegala and Kandy. He was grateful about the support given by then Army Commander Lt. General Sri Lal Weerasuriya towards this effort. He proposed the Government to pay a reasonable compensation and allow those who wanted to get married to solve enormous social and personal problems they face which was a Win-Win situation for the government and widows. Regrettably the proposal went up to the Defence Ministry level and collapsed in 2004 with the change of Government. He was elected President Ex-Servicemen's Association in 2003 and served as President for three years. As the Ex-President and Ex-Vice Patron of SLEASA he has submitted a 20-page dossier to the President last month, as the Commander-in-Chief of the Forces and its Patron, proposing a hospital for Ex-Servicemen and their dependants, who served the nation for nearly two to three decades and who are in need of assistance in the twilight of their lives due to poor health." "I am waiting the acceptance of my invitation to make a presentation in the near future outlining the main ingredients of the hospital project on behalf of Ex-servicemen and women of our country and I love to see it getting implemented during my life time," he said whole heartedly. His straight forwardness and honesty made him outspoken, as he could not bear injustice and corruption in the society. At the same time he is a very humble character who did not lose his head by positions. Whenever he organised an event after retirement he made sure that every member of the team is confident about what they are going to do and he was available till the last man completed his job to the end and their welfare was looked after very well. He also has a great liking and talent towards journalism and contributed many articles to various newspapers and appeared on TV programs on defence. Air Vice Marshal Harry Goonatilake and Mrs. Goonatilake are proud grand parents of seven grand children. Two of his grandsons including Shirantha's son are also looking forward to join the Air Force following their Grand Father and Father's footstep. If any of them make it to the Air Force in the near or distance future he would be the third generation of the Air Force, the first being his grand father Harry, the second generation being the father Roshan. Will it happen like the father and son commanding the Air Force in its 55 years history? He is often remembered of instructions given as a very senior officer to junior ones about not asking Other Ranks to carry out an order, which you cannot perform yourself. If it is not obeyed, one must ask yourself, why it was not obeyed rather than take the path of least resistance by pulling the person on a charge and inflicting punishment which is the reason why that great and immortal Napolean Bonaparte said: "THERE ARE NO BAD SOLDIERS, ONLY BAD OFFICERS" he concluded.